Adolf Hitler's early stated political aim was unification of the German people into one powerful and respected Germany. In this he initially succeeded, except for one case, the Swiss Germans. Absorption of the Swiss Germans was planned, but never carried out. "Die Schweiz muß noch geschluckt werden" (literally: Switzerland must still be absorbed) was the name of the operational plan approved in August 1940 to do just that. 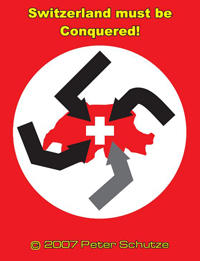 Switzerland must be Conquered is a simulation of the planned assault on Switzerland by Nazi Germany during World War 2. Other scenarios a variety of “war scares” Switzerland experienced when invasion seemed imminent. Players represent the military high commands directing their forces during what was sure to be a trying battle for all concerned. Fortunately for the German player, Adolf Hitler is busy elsewhere and will not interfere with your battleplans. Game scale is based on daily turns with each map hex being approximately 20 kilometres across. Army units range from regiments to divisions. A six sided die is required for play. Paul Kwon 8 8 8 InnovativeGame. Houdayer Bruno 10 10 10 Very interesting and original theme ! I play with it with great pleasure ! Gene Dickens 10 10 10 Printed out but rules not read. N ice upgrade to the original game. john conner 7 7 7 I don't care for the combat system, but the game overall is neat... and at least playable. Michael Barlow 9 7 8 Very unusal subject. Lots of good ideas swimming around in here. Lots of optional counters and many scenarios. Product needs a counter manifest. Paul Kantro 9 9 9 Well-presented game on an intriguing hypothetical situation.